The 2018 Elections are fast approaching, and Minnesota has an unusual number of contested primary elections. Judicial officers in Minnesota also face elections every 6 years, although there is rarely the same level of competition as in political offices. This year, 98 judges and justices are on the ballot, but there are only 8 contested races. Want to learn more about elections in Minnesota? 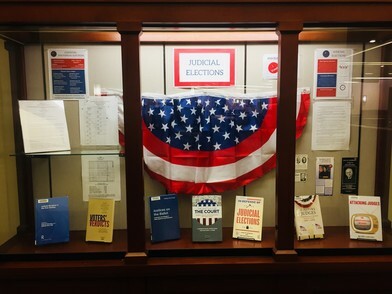 We have put together two display cases on Election Law and Judicial Elections. Visit the library between now and Election Day, November 6, 2018, to learn about voting rights, the origin of those red "I voted" stickers, and more. Minnesota allows same-day registration for voting. If you need to find out where you vote, visit pollfinder.sos.state.mn.us. If you aren't sure which candidates are running in your district, you can see who is on your ballot using the Secretary of State's "What's On My Ballot?" tool. To learn about judges running for judicial office, visit candidates.sos.state.mn.us or mnjudges.org. For those looking for user-friendly guides to the law, Nolo titles are often a popular resource. These guides offer information on topics like estate planning, bankruptcy, immigration, business planning, and real estate written in plain English. We have a number of these titles in our collection in hard copy, but we also offer access to Nolo titles digitally through the Legal Information Reference Center. The LIRC also provides access to other user-friendly legal guides. Visitors to the library can use this resource at any public computer in the library, or you can contact Ask a Librarian for a username and password to use this resource remotely. ... you can stream Minnesota Supreme Court oral arguments live online? You can find a schedule of upcoming live streaming arguments on the Judicial Branch website. You can also search previously recorded arguments from September 2005 to present. The Law Library will be closed on Monday, September 3, 2018 for Labor Day. We will respond to all questions on Tuesday, September 4, 2018. The Honorable Paul C. Thissen was sworn in as Minnesota's 95th Associate Justice during a public investiture ceremony on July 24, 2018. Read more about the ceremony here. Justice Thissen has also taken on the role of the Supreme Court Liaison to the State Law Library. Several laws passed during the 2018 Legislative Session went into effect on August 1, 2018. The laws include the sibling bill of rights, a modification of child support presumptions, incorporation of ATVs and snowmobiles into DWI laws, and more. For more information on the new laws, you can read this post from Minnesota Lawyer. The Minnesota State Fair starts on August 23, and this year you'll be able to learn about the court system while you get your corn dog and mini donuts. The Minnesota Judicial Branch will have a booth in the Education Building, so stop by to say hi and learn about your judicial district. The Supreme Court's October 2017 term wrapped up in June 2018 with decisions handed down in a number of highly anticipated cases. To view all cases decided this term, check out Oyez's archive. 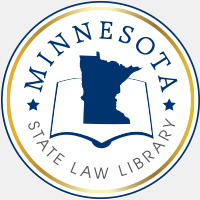 A couple of cases this term had Minnesota connections, including Sveen v. Melin, 584 US __ (2018), and Minnesota Voters Alliance v. Mansky, 585 US __ (2018), in which the Court held that Minn. Stat. 211B.11(1) prohibiting voters from wearing political apparel at polling places is unconstitutional.